The water in the ocean is constantly moving. On the surface we see water moving in the form of waves. Below the surface the water moves in great currents. One of the things many people love about the ocean is the waves. People love to play in the waves, surf the waves, and the sound of the waves crashing on the beach. Ocean waves are caused by wind moving across the surface of the water. The friction between the air molecules and the water molecules causes energy to be transferred from the wind to the water. This causes waves to form. In science, a wave is defined as a transfer of energy. 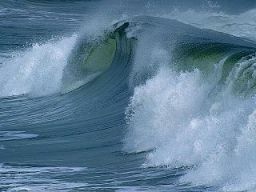 Ocean waves are called mechanical waves because they travel through a medium. The medium in this case is water. The water doesn't actually travel with the wave, but only moves up and down. It's the energy that travels with the wave. You can go here to learn more about the science of waves. Swells are rolling waves that travel long distances through the ocean. They are not generated by the local wind, but by distant storms. Swells are typically smooth waves, not choppy like wind waves. A swell is measured from the crest (top) to the trough (bottom). An ocean current is a continuous flow of water in the ocean. Some currents are surface currents while other currents are much deeper flowing hundreds of feet below the surface of the water. Surface currents are usually caused by the wind. As the wind changes, the current may change as well. Currents are also influenced by the rotation of the Earth called the Coriolis effect. This causes currents to flow clockwise in the northern hemisphere and counter clockwise in the southern hemisphere. Deep ocean currents are caused by a number of things including changes in the temperature, salinity (how salty the water is), and density of the water. One other factor impacting ocean currents is the gravitational pull of the Moon and the Sun. Do currents impact the climate? Ocean currents can have a significant impact on climate. In some areas warm water is moved from the equator to a colder region causing the region to be warmer. One example of this is the Gulfstream current. It pulls warm water from the equator to the coast of Western Europe. As a result, areas such as the United Kingdom are typically much warmer than areas at the same northern latitude in North America. The tallest wave ever measured was 1719 feet at Lituya Bay, Alaska. The tallest wave recorded in the open ocean was 95 feet during a storm near Scotland. Surface currents are important to ships as they can make it easy or difficult to travel depending on the direction of the current. Some marine animals take advantage of currents to migrate thousands of miles to and from breeding grounds. Ben Franklin published a map of the Gulf Stream in 1769.